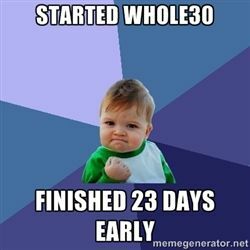 I knew I was going to have to post a follow up to my last post (written on Day #1 of attempting Whole30). I considered just deleting that post and pretending I had never mentioned it. But then I saw how many people actually read it and I thought I would share "the rest of the story." Many of my Facebook friends already know my journey well because I was posting status updates and food pics almost daily. I lasted 11.5 days complying strictly. I did have two unintentional noncompliant foods. But I ignored them because I had not chosen noncompliance. I accidentally ate a bite of something without checking the label and it had a little sugar in it. The other time, I forgot to ask if there was sugar in the marinade of a six ounce steak I ordered. The steak was so amazing, I wondered what was in their marinade (on my last bite). And that led to the next thought of, "Oh no, I didn't think to ask what was in the marinade." As it turned out, sugar was an ingredient. But it was too late. Rather than start over, I just kept going. I was amazed that I wasn't craving anything on my "do not eat" list. I was enjoying the foods I was eating. And I was highly motivated. I think I had an endorphin surge from feeling so in control. I was really proud of myself for being so committed. And I really did think I would follow the plan for the whole 30 days. But on Day #11, I just decided I didn't want to do it anymore. I didn't succumb to any one specific temptation. It really was just a well thought out choice to be a little less restricted because I was bored with my choices when eating out and I hated cooking three times a day. I also didn't like carrying my own dressing and ghee everywhere. But even more than that, I really hated having to ask so many questions of servers and knowing I could be noncompliant without even knowing it. I enjoy the whole experience of eating out. I not only enjoy great food, but I enjoy the social part of it. And doing Whole30 made going out far less enjoyable. So I deviated, but did not throw in the towel and binge or have a food party eating all the things that I know are not good for me. I just stopped being so strict. And after the 11.5 days of being so limited, eating what I would normally consider very healthy seemed like a party. The things I missed most were not unhealthy foods or fast foods or even pizza. I knew I could go 30 days without a specific food, a drink, sweets. And I'm always trying to avoid gluten as much as possible. What I missed were my healthy breakfast smoothies and my healthy vegan oatmeal bites (no sugar, no gluten, no gmo, no dairy). I missed Kind Bars. And, well, okay, I did miss the occasional margarita or glass of wine. But I went 17 days without any alcohol (saying it that way makes me feel like an alcoholic). And I've only had alcohol a few times since I deviated from the program. I was having a glass of wine more days than not (or an occasional cocktail). I have not returned to doing that. So I did "reset" myself psychologically, even though I didn't last "the whole 30." I was so public on Facebook about my motivation that I felt like a bit of a failure when I had to confess I wasn't going to finish successfully. But I'm okay with that. I was never trying to impress anyone (other than myself) with my self-discipline. Moderation has always been my strength when it comes to eating. And I think I mostly choose the right foods. My dad literally trained my brothers and I not to snack, not to eat before bed, not to eat empty calories, not to eat white bread, not to drink much soda pop. My parents didn't drink alcohol at all or smoke. They didn't model any vices or unhealthy behaviors. They walked for exercise almost daily. The most unhealthy thing I ever saw my mom eat was Ritz crackers with peanut butter and jelly, bbq chips and pepsi for lunch. She cooked us balanced meals. And she modeled moderation for me. She loved chocolate and kept a giant Hershey bar in the fridge at all times. But she broke off one square a day. And she was proud of that. So she made sure I knew that's all she ate. I don't know if she passed along her moderation gene or she taught me by example. But I am like her (most of the time). The only thing I have never bought into is her motto that nothing tastes as good as thin feels. In the moment, taste trumps thin every time. It's only later that it's not so good. The older I get, the more I realize I cannot take my health for granted. I've reached the age where I can't take my sleep for granted either. When I eat things I shouldn't or eat too late or have the second cocktail, I just about know I won't sleep as well that night. Although I am not allergic to gluten, when I don't eat it, I stop snoring, my silent reflux goes away, and I have some inflammatory skin issues that improve as well. So I really try to avoid it. But there will always be times I make a very conscious choice to splurge and just deal with the consequences. Even though I did not succeed in thirty days of compliance to Whole30, I don't regret reading the book or taking the abbreviated journey. I don't feel like a failure (except on Facebook...haha). I think I learned some things and I'm still limiting myself and making more conscious food choices most days as a result of what I've learned. I may even try again one day. I love your blogs and your posts. I would have dived head first into a bowl of Capn Crunch if I ever could make it past 30 days without sugar! I have made modifications to my diet by eliminating the obvious sugar choices but I would have never thought about sugars in not so obvious foods! I totally agree about the moderation aspect of dieting and eliminating things that do not agree-I still have a hard time saying no to French fries! In addition, exercise is key-especially for our older bodies to remain flexible and active. We too enjoy everything about eating out-as you can see from our current vacation family and food tour! Going to have to put the hammer down when we get back home! Hello, Steve! So nice to hear from you again! I have been terrible about writing on my blog in recent months. I'm happy to hear all is well with you on ibrutinib. John and his mom are both doing very well on venclexta. I am so thankful for these new drugs and so many options when something does fail and you need to make a new treatment plan. John is ten years out from diagnosis and very healthy. I haven't had a lot to report since they've both been doing so well. And when my mother-in-law was having challenges earlier in the year, I didn't want to share too much. I was actually quite worried and didn't want to share that publicly. But she has bounced back with gusto. She turned 85 in October and is going strong. Thanks for keeping in touch. I enjoy hearing from you. One of these days, I'm sure I'll get back to writing here again. I have let Facebook replace my blog posts.